Brady P. turned three on Sunday. Three! Happy birthday, Brady P!!! But don't go telling me that they just grow up so fast. That you blink and they're in college. That time just flies when they're little. That is not the case for Brady P. Pie Jones. He still wears pants made for a 12-month-old. The kids at school call him a baby, and some of them are three years old too! He doesn't talk. He doesn't dress himself. He still poops in his diaper and denies it. Don't think I am complaining. I don't know any different, and I really don't care because he is my Braeden. He is different, but he is awesome. In our daily life, he amazes me everyday. He is so sharp, storing a wealth of knowledge in his brain. His loving eyes and smile captivate innocent passersby. He shows interest in his independence. He is curious about e.ver.y.thing. Everything. It's no wonder it takes us so long to walk to the lakeshore! And I wouldn't trade him for an ordinary kid. Nope. I'm glad he is extraordinary. This summer he surprised Grammy Linda and me with his exuberant gestures to oration and songs. I wasn't going to share this video with the Internet (mostly because I was trying to chant like a preacher), but it illustrates the awesomeness of Brady P.
We did this totally impromptu, but it is still one of our favorite videos to watch. 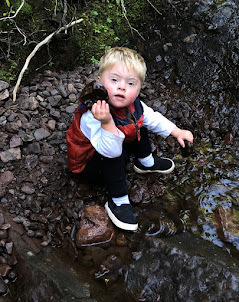 So I have started advocating for Brady P., people with Down syndrome and every person on this planet. I can't help it. It's what I came here to do. I am a member of the Upper Peninsula Down Syndrome Association. They raise funds to help educate and support families of a person with Downs. They also offer fun events that allow the parents and families to get together and bond. Oh, man, do I love that part. I am joining the Parent Advisory Committee for parents of a child with special needs in the Copper Country. Through that organization, I have also heard of other programs available in the U.P. I can announce those once I check them out. I wrote my memoir about raising Brady P, and how that affected my life dramatically. I founded the Brady P. Project, which is a non-profit organization through the state of Michigan and, after it raises its start-up goal, it will become a federal 501c3 non-profit organization. If I would have had an ordinary child, I would probably still be freelance writing for outdoor adventure publications. A fine career, but this new path has so much more meaning for me. So much passion. So much purpose. So much love. Thanks for being a part of it. Now this is a free blog, and it will always be that way. But I have an idea. If you would like to give a gift in honor of Brady P.'s birthday, why not donate to the Brady P. Project? It a can be a gift in any amount. Though your donation is not yet tax deductible, it will be once our initial $400 goal is reached to apply for 501c3 status. Thanks. Even if you don't donate, thanks for reading and expanding your heart and mind. Smiley face.